Take a tennis lesson with any of our experienced and certified teaching professionals to improve your game! 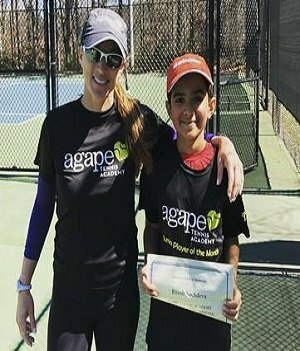 To schedule a lesson, contact the tennis director or the pro of your choice for availability at (404) 636-5628 or info@agapetennisacademy.com. Save $5 per lesson when you pre-pay for a series of private tennis lessons! Available in 5 or 10 One-Hour sessions. Please note: Private lessons must be cancelled with 24 hours of notice or you will be expected to pay for the lesson. All the physical training in the world is useless until you have learned the proper mental skills that allow you to use your physical skills. Schedule a Mental Toughness Training Session with Amy Pazahanick, Certified Mental Toughness Trainer.